Shri Rajendra Pal Gupta, writer of 'Aryavartta Demystified' has been an ardent Arya Samajist and Vedic thinker. Born on July 8th, 1936 at Kamal, he received his initial education in several branches of Live Sciences. He had a distinguished career in the Ministry of Agriculture where he held several positions before his retirement from a responsible position in the 'Central land Use Board'. He has been associated with Atharva Bharat since the last 16 yrs. He has authored and edited several books on Vedic Dharma. Some of his books are :- 'What Is Vedic Dharma? ', 'Summary of Satyarth Prakash', 'Biography of Maharishi Dayanand', 'Speeches by Prominent Arya leaders on the occasion of the Birth Centenary of Maharishi Dayanand-Compiled and Edited', 'Perceptions and Virtues of Mankind', etc. Miss Neeta Gupta, the co-author of the 'Aryavartta Demystified' has done her Master's in Developmental Psychology from Columbia University (U.S.A.) in the mid 80s with a background in Philosophy, Aesthetics and History. In the early 90s she was a columnist for various English and Hindi newspapers. Alongside she edited and published a magazine called Atharva Bharat Sanskritik Patrika for 15 years and 159 issues of this magazine had been published. Due to her knowledge in ancient History and women's development throughout the ages she was appointed as Astt. Director at I. C.H.R. In the year 2003 she formed Atharva Bharat Research Foundation through which educational programmes are being organised from time to time. In the book' Aryavartta Demystified' the learned authors have dealt with the Philosophy of Aryavartta, Components of Aryavartta and Geopolitics of Aryavartta. Shri Rajendra Pal Gupta, a scholar of science has an aptitude for religious, spiritual, social and cultural values and wants the people of the world to get united and behave with each other in a humanly manner. He does not want the people of different nations to have a gesture of awe and anger against each other but of friendliness. He is a religious man. More over, he is a spiritual person. He is a follower of Maharshi Dayanand Saraswati. The same is the case of Miss Neeta Gupta. She is a scholar of history. Her way of writing seems to be very natural as ducks taking to water. In the chapter genesis of Aryavartta, she has described Aryavartta as a contiguous physical geographical unit since times immemorial. The history of this Great Nation and its cultural universality is well described in Manusmriti, Ramayana, Mahabharata and Arthashastra of Kautilya. She has no hesitation in giving references from the religious books of Bharat, Tibet, Iran, Indonesia, China and so on. She has dealt with, in details about the history, invasions and survival of Bharat i.e. Aryavartta's cultural existence and integrity, and unity as well. She explores the customs and traditions of the neighbouring countries which need to be merged in Aryavartta of present day. 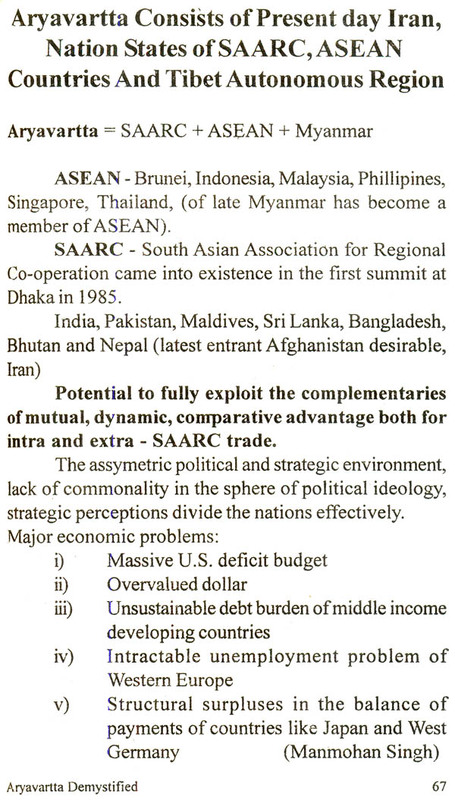 She wants that the rulers, political authorities of SA ARC and ASEAN nations that comprise of Hindus, Buddhists, Muslims and Christians, awake, arise and unite to accord primacy to public interest and sink their petty differences while tackling the major problems across the table and evolve a forum to identify internal and external threats and institutionalise a mechanism to solve internal conflicts. The first part of the book Philosophy of Aryavartta is the base of the whole structure which the two learned authors wish to raise as united Aryavartta and its cultural universality, bound each to each by natural piety. The Vedas revealed by God through the rishis Agni, Vaayu, Aditya, and Angira, are our guiding force and tell us the tenets of Dharma. It is important to note that 'had this fact of there being a common code of conduct for all human beings been unreservedly acknowledged and universally accepted by one and all, the world would have surely been free from all clashes and miseries which arise out of ignorance and non-recognition of this fact'. The authors have very wisely quoted Maharashi Dayanand Saraswati - 'Though the human soul possesses the capacity for ascertaining the truth, yet through self interest, obstinacy, wrong - headedness, ignorance and the like, it is led to renounce truth and incline towards untruth'. The authors have dealt with the three basic entities - God, Soul and Matter in details. The discussion leads to develop an attitude for inculcating moral values among the masses. The authors have referred to the great scientists - Newton and Einsten and have quoted from the scriptures and the writings of Maharshi Dayanad Saraswati to prove that God is an Architect as well as Engineer, The quotation about the wonderful organisation of the body compells us to accept the supremacy of God.